Beginning at AZ Hwy 69 and U.S. Hwy 89 (in Prescott); northerly on U.S. Hwy 89 to the Verde River; easterly along the Verde River to I-17; southwesterly on the southbound lane of I-17 to AZ Hwy 69; northwesterly on AZ Hwy 69 to U.S. Hwy 89; except those portions that are sovereign tribal lands of the Yavapai-Prescott Tribe and the Yavapai-Apache Nation. Overview: Unit 19A has some of the highest antelope densities in Arizona. Herds are currently doing well with good fawn survival. Unfortunately, habitat loss is occurring at a rapid rate due to development of private lands. Many popular hunting areas are slated for future development. Much of the unit’s antelope population lives in or near the Town of Prescott Valley. It is unlawful to discharge a firearm within ¼ mile of a residence or occupied structure. Not all of Unit 19A is open to pronghorn hunting. Review the current hunt regulations to determine what areas are open to hunting for certain seasons. If hunting in the Lonesome Valley area, hunting access in this area is quite limited and most of the pronghorn habitat here is privately owned. Hunters should be diligent in looking for posted private property signage. Scout the area well in advance; identify land ownership, and request permission of the landowner if the area you wish to hunt is on posted private lands. Some of these requests are declined. For archery: See current hunt regulations for open hunt areas. The open archery hunt area of unit 19A is north of Arizona Highway 89A and the portion south of Arizona Highway 89A that is east of Robert Road, north of Arizona Highway 69/169, and west of Forest Road 151/643. Hunters should be diligent in looking for posted private property signage. This hunt is not a wilderness experience. The open hunt area is in close proximity to an urban area and high hunter densities are typical. Be courteous of others – other hunters keep antelope moving around. These hunts are during the rut and use of antelope decoys may be effective, as are blinds near water sources. Water sources are in high demand by hunters for blind locations. Set up your blind early to establish your site, but hunters must be tolerant of others also wanting to use the area. Remove all blinds following the hunt. Be mindful of your image as a sportsman and be courteous of Prescott Valley residents. Many residents are non-hunters and enjoy the presence of antelope near town. Be respectful by not walking through yards or dragging dead antelope past neighborhoods. Because these hunts are during the rut, bucks are relatively easy to stalk. Watch for a buck that is chasing does or actively driving off other bucks. When this buck circles out of sight, move into this area and wait behind any available cover. Many times the buck will return and continue to recklessly defend this area. These hunts occur during hot weather. Remove harvested antelope quickly and cool the meat as soon as possible to prevent spoilage. Firearms hunters: See current hunt regulations for open hunt areas. The open general and muzzelloader hunt area of unit 19A is north of Arizona Highway 89A and that portion south of Arizona Highway 89A that is east of Fain Road, north of Arizona Highway 69/169, and west of Forest Road 151/643. There are developed areas and a ranch headquarters throughout the area. It is unlawful to discharge a firearm within ¼ mile of a residence or occupied structure. Be advised, laws pertaining to unsafe use of firearms and other violations will be strictly enforced. Hunting access in this area is quite limited and most of the pronghorn habitat here is privately owned. Hunters should obtain access permission here before applying for this hunt. Obtain a map which shows private, State Trust, and public land designations. Scout the area well in advance; identify land ownership, and request permission of the landowner if the area you wish to hunt is on private land. Some of these requests are declined. Overview: Black bears are more vulnerable to hunting in late August and early September, when they travel to low elevation hillsides to feed on the ripening prickly pear cactus fruit. By October, most bears have moved with the food source; leaving prickly pear stands and feeding on acorns in the more remote canyons. Please review the hunting regulations for information and the phone number to determine if the unit remains open to bear hunting prior to your hunt, and for required harvest reporting procedures. A mandatory physical check-in of all harvested black bears is now required within 10 days of harvest. Areas: During most of the year, the unit’s bears live in the upper steep canyons of Mingus Mountain and Woodchute Mountain, which contain thick vegetation and permanent water sources. In late August and September, bears move lower in elevation to find ripening prickly pear cactus fruit. When this supply runs out, and as bears are trying to put on fat for the winter, they look for patches of oak trees that produced good crops of acorns. The best acorn patches change from year-to-year and require pre-season scouting. Overview: The elk population in Unit 19A is relatively low. A small archery bull hunt has been offered here annually since 1993. With the expansion of the elk herd, a rifle bull hunt and rifle cow hunts were added in the past few years. Check stock tanks for elk use (tracks) prior to the season. Areas of elk concentrations change somewhat year-to-year, depending on localized summer rainfall filling stock tanks and greening up vegetation. Monsoon-type storms during the archery bull hunt briefly intensify elk rutting behavior, aiding hunters who stay afield. Most elk in Unit 19A are relatively low in elevation and temperatures are still warm during the archery hunt. Plan ahead to make sure your hunting location and your elk removal/field care procedures allow meat to be cooled quickly after harvest to prevent spoilage. Cold storage facilities are located in the surrounding towns of Camp Verde, Dewey, and Chino Valley. Areas: Most elk in Unit 19A are in the juniper and shrub oak habitat types – lower in elevation than hunters would expect. These areas have dense vegetation cover, so stalking may be difficult at times. The Prescott National Forest map identifies the following locations where most of the unit’s elk are found: Onion Mountain (just north of the I-17/Hwy 169 junction), Boulder Canyon, upper Cherry Creek, Powell Springs, Goat Peak (note that some of this area burned during the summer of 2003), upper Ash Creek, and Burnt Canyon between Forest Service roads 413 and 132. Lower elk densities are found west of Woodchute Wilderness in Martin Canyon and CCC Canyon, northwest of Woodchute Wilderness in Munds Draw and Wildcat Draw, and near the Verde River off Forest Service Road 638 downstream to Perkinsville (at the junction of County Roads 70/72). Overview: Javelina hunts take place during the winter rainy season, so please be mindful of Forest Service road closure signs to prevent these roads from being torn up and possibly getting your vehicle stuck. Rules pertaining to off-highway travel and road damage are strictly enforced. The key to successful javelina hunting is spending a lot of time glassing. Remember that javelina are fair weather creatures and are most active during periods of good weather. Areas: Good bets for glassing javelina are the east and west foothills of Mingus Mountain. The terrain here allows you to see for a long way. Other areas with good concentrations of javelina include Copper Mountain (northeast of the town of Mayer), Ash Creek (from just north of Highway 169 to south of the highway), the Agua Fria River drainage (from the town of Dewey southeast to Interstate 17), and the canyons north of Orme School (northwest of the Interstate 17/Orme Road junction, near the confluence of Ash Creek and Cienega Creek). Overview: Each year, between two and six lions are reported harvested from Unit 19A. Most of these lions are taken with the assistance of hounds during the winter months, when lion sign is easier to locate in the snow. Other methods of hunting lions are varmint calling and glassing for lions with binoculars. Please note that all successful lion hunters must present their lion to the Arizona Game and Fish Department within 10 days for a mandatory physical check-in. Areas: Lions can be found unit-wide since individual adult lions can have large territories. Good lion habitat is generally rocky canyons that have at least some dense patches of brush. Nearby water is also helpful in locating lions. Check the mud around stock tanks for lion tracks. 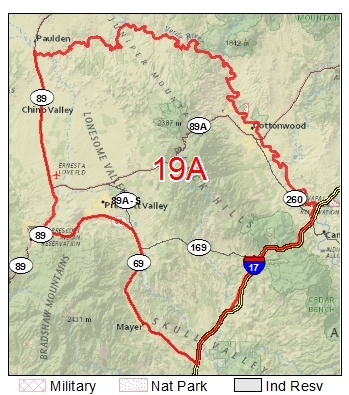 Some areas in Unit 19A to hunt include: north central (the canyons draining north into the Verde River), west side of Woodchute Wilderness, west side of Mingus Mountain (from Hickey Mountain to Tex Canyon), south of Mingus Mountain (from Ash Creek to Table Mountain), south of Highway 169 (near the Cienega Creek, Ash Creek, and Agua Fria River drainages). Overview: Mule deer numbers in Unit 19A have increased in recent years. The Coues whitetail deer population in Unit 19A seems more stable, although there have always been relatively few whitetail in the unit. Access to the west side of Mingus Mountain north of Hwy 89A has become limited due to housing developments – it is best to reach this area from Perkinsville Road (County Road 70) off of State Highway 89 in Chino Valley. The area immediately east of Watson Lake is private land. Obtain permission before hunting this area. On the top of Mingus Mountain is a Forest Service recreation area, which encompasses some private homes, the Forest Service’s Mingus Campground, the fire lookout tower, the Methodist Church Camp, and Mingus Lake at Elks Well. No discharge of firearms is allowed in this recreation area. Also, per state regulations, no firearms may be discharged within 1/4 mile of any building without permission of the owner. Areas: During the fall archery hunt, and during mild weather conditions for the rifle hunt, many deer are in the Ponderosa pine habitat on top of Mingus Mountain and in the juniper habitat on the sides of Mingus Mountain. The Woodchute Wilderness Area and the west side of Mingus Mountain are good hunting areas at this time. The area near Copper Mountain and the Agua Fria River near the town of Mayer is also productive. After cold weather sets in (snow is possible at higher elevations during the opening weekend of the rifle hunt), many deer move to lower elevations, to areas north of St. Matthews Mountain and towards the Verde River, and the lower foothills of Mingus Mountain and Woodchute Mountain. ATV habitat damage has led to the Forest Service closing most of the roads leading to the Verde River. Please observe all Forest Service road closures, as identified on the Prescott National Forest’s “Motor Vehicle Use Map”. This map identifies the open roads and trails on the forest. It is free of charge, and may be obtained at any U.S. Forest Service office in the area. Overview: Unit 19A has limited hunting of tree squirrels. Although the unit has both Abert’s and red squirrels, it does not have much squirrel habitat (stands of pine/fir). Much of the pine type is located on top of Mingus Mountain, within a Forest Service recreation area where hunting is prohibited. Some areas to try on top of Mingus Mountain include Gaddes Canyon, Burnt Canyon, upper end of Black Canyon, and the upper end of Ash Creek. Overview: When late winter and springtime precipitation is above average, it results in good forage and seed production that improves Gambel’s quail reproduction and survival of the young. Since a large percentage of the quail population is made up of young-of-the-year birds, these rains will have a large impact on the quail population that is present during the autumn hunting season. Hunters are usually most productive hunting brushy hillsides in close proximity to permanent water sources, such as earthen stock tanks. Many quail hunters use pointing dogs toward the south end of Unit 19A because of the more open terrain and the absence of cholla cactus, which hunters encounter in hunting units closer to Phoenix. Areas: East of the Town of Chino Valley and north of Perkinsville Road (County Road 70). Western foothills of Mingus Mountain. Agua Fria River drainage and Ash Creek drainage south of Highway 169. Brushy hills north of Highway 169. Overview: The turkey population in Game Management Unit 19A is on a relatively stable trend within the limited habitat which exists. Turkeys occupy a range of elevations from areas along the upper Verde River up through the higher Mingus Mountains east of the Chino Valley/Prescott area. Unit 19A turkey populations have been augmented with several translocations and recent forest management activities have benefited this species as well. A limited stratified spring shotgun shooting shot season was initiated in 2015. When hunting turkeys during the spring season, make sure the bird you’re about to bag has a visible beard. Don’t rely on a colorful head or even the sound of a gobble when making a decision to shoot. Also be sure no other turkeys are behind or adjacent to the bird you decide to take. Accidentally killing multiple birds with one shot is more common than one might think. Areas: Pre-season scouting is important in locating birds and areas of activity. Look for tracks in the road or at water tanks. Mingus Mountain, Woodchute Mountain and along the upper Verde River areas hold small populations of turkeys. Potato Patch and Mingus Mountain are forest Service campgrounds (Prescott National Forest) at the top of Mingus Mountain near State Hwy 89A. The Forest Service Powell Springs Campground is located near the town of Cherry at 5,300′ elevation. Camping is allowed on Forest Service and BLM-administered public lands within the unit. Elevation ranges from 3,300′ to 7,800′. At the lowest elevation, near the Verde River, riparian vegetation of cottonwood-willow persists. The western edge of the unit near Prescott Valley and Chino Valley supports open grasslands. Chaparral-association plant species dominate the foothills and lower slopes of Mingus Mountain and Woodchute Mountain. These species give way to juniper and ponderosa pine at the higher elevations.